In spite of weathers, one of Yoshy’s daily routines is walking with Erie every morning and night and another one is brushing her after walking. Erie must be sweltering, too. Her hairs are being lost in invisible way to make her cooler. The tree with Erie was taken a picture on Saturday, August 17th. 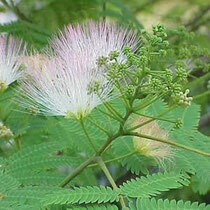 The name of it is “Persian silk tree”. The tree stands on the west side of LL Shihoya Arai School, very close. All the leaves withered and fell down very quickly to the lawn in a couple of months, in June and July. “My! 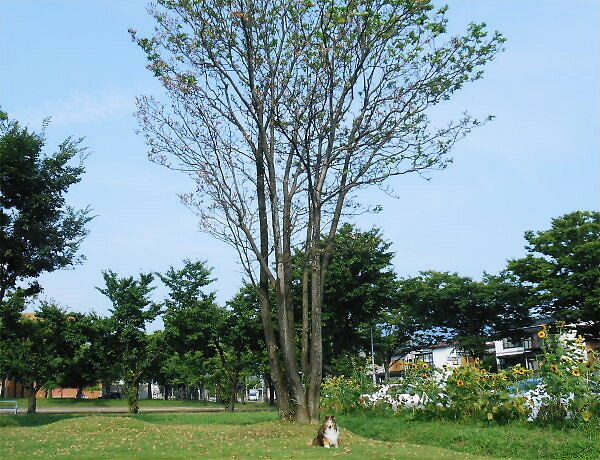 Is this tree withered by this boiling heat?” I was worried in my mind. In the early August, I found “young green leaves” at the top of it. Now half of the tree is covered with young leaves. I can still hardly imagine that young leaves are growing under the flaming sun. … I was seeing it in the view as “a piece of a landscape”; I am ashamed of myself. “Changing clothes of the Persian silk tree” made me remind of Phoenix rising from the boiling hell. The language of this flower is “glee” or “creative ability”, etc.